20 dB 1 GHz 2 Port Cable TV Master Antenna Directional Drop Tap Coupler can be used for in-wall Installation on, to or behind Wall-Plates. This Product line Features Numerous other Values and port configurations to facilitate proper Cable TV Antenna, Master Antenna, CATV MATV and SMATV distribution system design in Hotels, Motels, Apartments, MDU's, Offices and Home. Refering to the Photo, you'll see that the "In" and Thru" F Connectors are on the same plane to reduce the profile of Physical space needed to install and Maintain the connections to RG-6 or RG-59 Coaxial Master Antenna or TV Cable Feed behind the Wall Plate and inside the wall itself. The "Tap" port "F" connector is at 90 degrees as it is normally installed with this port protruding throught the wall plate itself (to which the Rg coaxial cable feeding the actual TV set is attached), leaving the input and output connections at right angles behind the wall plate to maximize ease of installation. A 7/16 inch wrench (common F connector wrench) is recommended for securing the Coaxial Cable Feed F connectors snugly onto the Drop Tap prior to securing the wall plate/Drop Tap combo to the wall or in-wall outlet box. As "Loop" fed Satellite Cable TV Antenna distribution systems run distance the length and breadth of the Property, looping around the building(s) (servicing the TV's it passes by, "Tapping" off some signal to each one), some Satellite Master Antenna and Cable TV Company feeds use Frequencies that are FCC restrictive and "leaking" signal would not only feed back into the antennas and amplifiers on the Hotel motel Apartment property, causing interference and Poor Picture Quality; but also Interfere with other "Off Air" users of the Radio Frequency Spectrum, including Aircraft, which could result in an incident. The selection and placement of Drop Taps by the rated Value in dB should successively drop in value starting from the Drop Tap closest to the Cable TV or Antenna Signal Amplifier, each "Thru" port in turn feeding the next "In" port towards the next amplifier or end of the cable run; resulting in less signal left on the cable feed after insertion through each Drop Tap. The Specification Sheet link provided above will give you the "Thru" (to the next Drop Tap) and "Tap" (to the TV itself) leg losses of each value, so that along with the loss through each successive inter-connecting cable based on length; this information can provide a simple subtraction formula to calculate signal levels at each point, starting with the Output level of the Amplifier in dBmv and ending when there is simply not enough signal left in the Cable to feed another Drop Tap or TV set. For regular analog signals, the FCC recommends no less than 0 dBmv input for an acceptable picture quality. For feeding Hi-Speed Internet Cable TV Broadband Modems or FM receivers, it can be much simpler as the system feeding you signal is already designed. Typically, Cable TV companies install a DC-9, DC-10 or DC-12 with the "Thru" leg feeding the rest of the Premise, and the "Tap" leg feeding the Modem. The placement of the DC is usually co-located at the point where the Cable TV Company feed makes its "Appearance" in the building or premise, after the ground block bond, with a separately run RG coaxial cable feed directly to the Modem. Recently though, with "Instant Installs", the Modem will get fed whatever signal is available in close proximity without revising or revisiting the drop system architecture with a proper signal level analysis based on the design spec.s. Most modern Modems have the range to compensate for high levels by introducing attenuation to lower the signal level into range, but low signal levels can only be addressed by correction. If there is a requirement for more signal to the Modem, simply drop the Tap value. Most folks have issues with the Hi-Speed Internet for 2 reasons; poor signal level (which can be your issue or the Cable TV Company's depending on who is responsible for the install) or Return Ingress (interference coming into the cable system) because of "Leaky" Cable TV System, which is definitely their realm. If you do have need to introduce an amplifier into your system, make sure it is return passive to maintain the two-way link-up. FM receiver connections to Cable TV systems with said service will usually require a DC-15 or thereabouts for proper signal level introduction into the Receiver. Check with the System's Chief Technician for the Spec.s. RF Directional Couplers are like splitters in that they can feed two lines from one, or combine two signals into one cable or feed. The insertion and coupling loss is different however, when compared to a simple two way with an equal split of one half, or 3 dB. The Directional Coupler will "Tap Off" Some signal to feed a local TV or similar component and send the Majority "Thru" to continue on down the Line to Continue or Repeat this exercize over and over again. This type of Distribution occurrs in "Loop Run" systems that essentially run one cable past each user in a "Loop", Tapping signal to feed each as it passes. This example is used in most Hotels and Motels as the cable runs up or down from floor to floor passing the next room above or below, using a Tap to "tap-off" signal to each room as it passes. In a more Domestic Situation, a coupler is handy to feed a device close to the origin of the signal (like where the Cable TV company attaches to the house outside) and send the majority through a relatively long run to feed other devices at the end. Cable TV Companies do this quite often in "Tapping-Off" signal to feed the Cable Modem. Another Situation would be that one device simply requires more than the other and both would be Accomodated using this Device. They are typically rated in dB as to the Loss incurred from "Input" to "Tap" leg, with the "Thru" Leg suffering comparatively less loss. The Higher the dB Tap value, the lower the "Thru" leg loss. If you are adding several Directional Coupler Drop Taps to an existing Cable TV or Antenna feed, you may need to compensate for the loss that you are about to introduce. The gain of a Line Amplifier should be selected to zero out the loss that follows it. In other words, if you have fifty feet of cable and a two-way splitter, then a 10 db amplifier will be fine. Conversely, if you have an eight-way splitter and hundreds of feet of cable, you will need an amplifier with a higher gain. Just as in the case of a Pre-Amplifier, however, bigger is not always better. HOLLAND 20 dB Directional Coupler 5-1000 MHz. Holland Electronics DCG2-24 dB 2 Port Directional Coupler 5-1000 MHz. 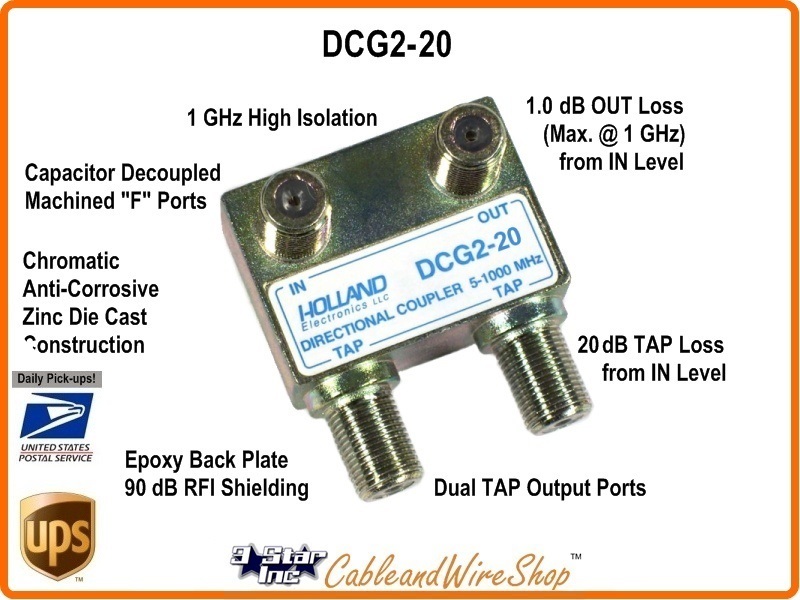 Holland Electronics DCG2-27 dB 2 Port Directional Coupler 5-1000 MHz. Holland Electronics DCG2-30 dB 2 Port Directional Coupler 5-1000 MHz.